Atlanta hitters enjoyed their most productive night in their new stadium, and that made things easier for Brandon McCarthy in his Braves debut. 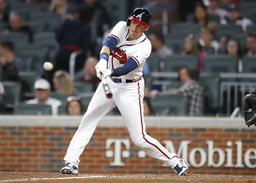 Ender Inciarte drove in four runs with three hits, Ryan Flaherty had four hits and scored four times, and the Braves roughed up Vince Velasquez and the Philadelphia Phillies for a 15-2 win on Saturday night. The Braves' runs and 19 hits were team records for SunTrust Park, which opened last season. McCarthy (1-0) allowed two runs in 5 1/3 innings, but wasn't satisfied with what he described as a "rocky" performance. "The runs obviously made it much easier," McCarthy said. "I could just go out and just try to throw and not fight myself as much." The Braves scored four runs in the third to open a 7-2 lead. One out after Nick Markakis' bloop single plated two runs, manager Gabe Kapler came to the mound to replace Velasquez. Left-hander Hoby Milner, the only reliever up in the bullpen, apparently wasn't ready to enter the game. Kapler remained on the mound as Milner took extra throws before leaving the bullpen. Braves manager Brian Snitker came out of the dugout to argue about the delay, and was ejected by umpire Jerry Layne, the crew chief. Layne said he was trying to protect Milner's health. "For whatever reason the pitcher wasn't even getting ready," Layne told a pool reporter. "Who got crossed up, I'm not placing blame on anybody because I don't know. He just wasn't ready. Hadn't thrown a pitch. ... The last thing I want to do is get somebody hurt. It's already a messed-up situation." Layne said a report would be sent to Major League Baseball. "Whoever's at fault on the Phillies' side should have to answer to Major League Baseball," Layne said. Kapler said Milner warmed up earlier in the game. "Anytime we have a miscommunication, that miscommunication is my responsibility so I take full responsibility for it," Kapler said. It was Snitker's second ejection of the series. "It was the first time I've ever been part of anything like that," Snitker said. "I think the time had expired and just felt like we should have been playing ball." The Phillies' sixth pitcher was utilityman Pedro Florimon, who gave up a two-run homer to pinch-hitter Lane Adams in the eighth. Phillies: RHP Tommy Hunter (strained hamstring), who opened the season on the 10-day disabled list, is expected to report to Class A Clearwater next week. Braves: C Kurt Suzuki suffered what he said was "really bad" bruising but no broken bone when he was hit by a pitch on the side of his right hand on Friday night. The hand was still swollen on Saturday but he said he hopes to play Monday or Tuesday. C Tyler Flowers was placed on the 10-day DL on Friday with a strained left oblique and could miss one month. After the game, the Braves announced they had acquired catcher Carlos Perez from the Los Angeles Angels in exchange for infielder Ryan Schimpf. Perez, 27, was designated for assignment by the Angels on Tuesday after hitting .265 in 17 spring games. The Braves acquired Schimpf, 29, from Tampa Bay on March 5 and optioned him to Triple-A Gwinnett on March 18. Right-hander Josh Ravin, who appeared in a combined 33 games the last three seasons with the Dodgers, was recalled by the Braves and pitched the ninth, giving up only a walk. Left-hander Rex Brothers was optioned to Triple-A Gwinnett. Right-hander Akeel Morris was designated for assignment. Kapler says the bullpen is the Phillies' strength, but too much stress was placed on the relievers in the series. The relievers posted a 7.47 ERA, allowing 13 earned runs in 15 2/3 innings, in the three games. Phillies starters lasted only 12 innings. Phillies: RHP Ben Lively will face New York's Matt Harvey when Philadelphia opens a series at the Mets on Monday night. Lively was 2-1 with a 2.33 ERA in three starts against the Mets in 2017. Braves: After a rare Sunday off day, the Braves open a home series against Washington on Monday night when LHP Sean Newcomb makes his first start of the season.